War has ravaged the world. Cities lie crumbled. Forests smolder. The crows feast. In the ruins, Requiem's last dragons lick their wounds and mourn a death among them. But they will not have long to grieve. From the ashes, a new enemy arises, one more horrible than any before. His soldiers dead, the tyrant Dies Irae collects severed limbs, heads, and torsos. He sews them into rotting, maggoty mimics of life. With dark magic, he animates his creations... and sends them hunting. The mimics live to kill. They do not sleep. They feel no pain. They never stop hunting. Worst of all, they undo all magic around them. 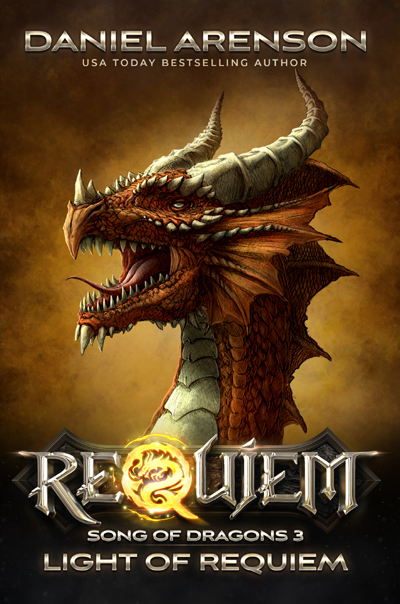 When mimics are near, Requiem’s survivors cannot become dragons... and must fight as humans. Without their greatest gift, how can Requiem’s children survive?